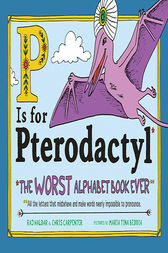 Turning the traditional idea of an alphabet book on its head, P is for Pterodactyl is perfect for anyone who has ever been stumped by silent letters or confused by absurd homophones. This whimsical, unique book takes silent letter entries like "K is for Knight" a step further with "The noble knight's knife nicked the knave's knee." Lively illustrations provide context clues, and alliterative words help readers navigate text like "a bright white gnat is gnawing on my gnocchi" with ease. Everyone from early learners to grown-up grammarians will love this wacky book where "A is for Aisle" but "Y is definitely not for Why."